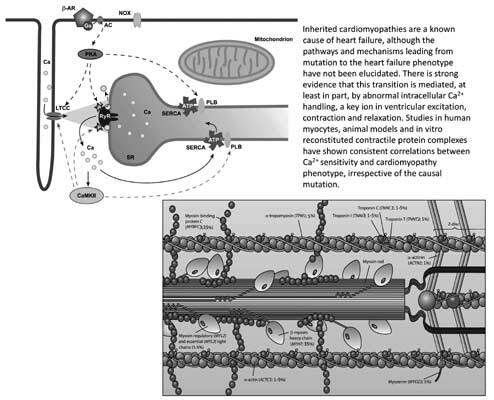 Inherited cardiomyopathies are a known cause of heart failure, although the pathways and mechanisms leading from mutation to the heart failure phenotype have not been elucidated. There is strong evidence that this transition is mediated, at least in part, by abnormal intracellular Ca2+ handling, a key ion in ventricular excitation, contraction and relaxation. Studies in human myocytes, animal models and in vitro reconstituted contractile protein complexes have shown consistent correlations between Ca2+ sensitivity and cardiomyopathy phenotype, irrespective of the causal mutation. In this review we present the available data about the connection between mutations linked to familial hypertrophic (HCM), dilated (DCM) and restrictive (RCM) cardiomyopathy, right ventricular arrhythmogenic cardiomyopathy/dysplasia (ARVC/D) as well as left ventricular non-compaction and the increase or decrease in Ca2+ sensitivity, together with the results of attempts to reverse the manifestation of heart failure by manipulating Ca2+ homeostasis. calcium, cardiomyopathy, Ca2+ sensitivity, hypertrophic, dilated, restrictive. Department of Cardiology, Athens General Hospital “G. Gennimatas”, Mesogeion 154, 11527, Athens, Greece.